Its graduation time. Living in a college town, even if it is a small college, graduation means the town empties. Its a big anniversary for me this year. I get to look forward to my 20 year high school reunion. Yes, I know I am old. 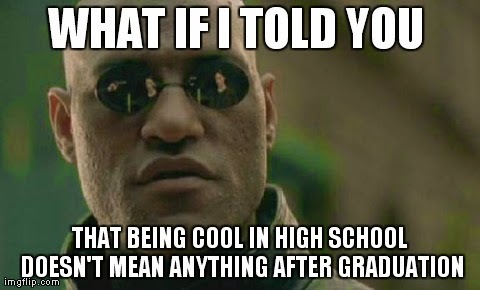 Yes, I also know I don't look (or act) my age. I take pride in that. I've been thinking about the year I graduated a lot lately. How I thought my life was going to end up and how it really is are nothing alike. I've been thinking if I could go back in time and talk to me what would I tell myself. and then theres facebook where the 'popular' kids get a nice reality check!